Introduction: Ganglioneuromas, benign tumors of sympathetic nervous system are rare to arise in adrenal gland. They are usually asymptomatic and hormonally silent. Majority of cases are detected incidentally during work up for other unrelated conditions. Currently histopathologic examination is the only tool to diagnose ganglioneuroma and to differentiate it from other neural crest tumors. Up to the current era of laparoscopic adrenal mass excision, this unusual entity has not been adequately reported in american surgical literature. Report: We describe a case of a 51 year old male with history of hypertension who was found to have abdominal bruit by his primary care physician during regular physical examination. Abdominal CT scan discovered a 4 cm right adrenal mass with upper pole calcification and 6 cm retropancreatic mass. Both masses are mainly hypodense on arterial imaging and heterogenous on delayed phase films. Endoscopic ultrasound guided needle biopsy was indeterminate. Preoperative endocrine evaluation showed mildly elevated vanillyl mandelic acid (VMA) with normal 24 hour cathecolamine, metanephrine and cortisol levels. Histopathologic examination after Laparoscopic excision consistent with diagnosis of ganglioneuroma. Conclusions: Ganglioneuroma occurs rarely in adrenal gland and preoperative diagnosis is difficult since symptoms are usually nonspecific. 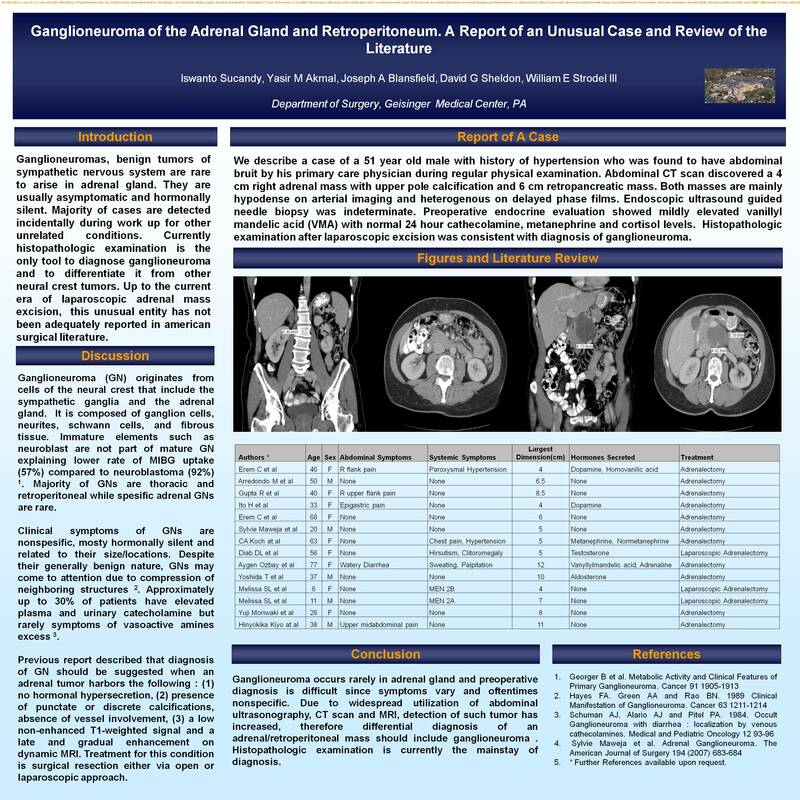 Due to widespread utilization of abdominal ultrasonography, CT scan and MRI, detection of such tumor has increased, therefore it should be included in differential diagnosis of adrenal or retroperitoneal mass. Histopathologic examination is currently the mainstay of diagnosis.